As a “thank you to the greatest fans in the world”, MANOWAR have released an official video for the track "The Heart Of Steel MMXIV", which is taken from the band’s thirteenth studio album, Kings Of Metal MMXIV, released in February 2014. It's a re-recording of their Kings Of Metal album from 1988. 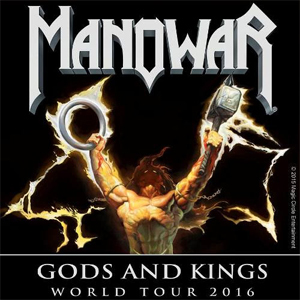 MANOWAR's upcoming European Gods And Kings World Tour 2016 continues to make history: For the first time ever MANOWAR will play in Belarus. The show is confirmed for Tuesday, February 16th at Minsk Sports Palace in Minsk, Belarus. The Gods And Kings World Tour 2016 will celebrate Kings Of Metal MMXIV, which many fans haven’t had a chance to experience live yet, as well as the upcoming anniversary of Gods Of War, which was unleashed on the world in 2007. The set list will be packed with fan favorites from both albums, plus many other classics and special surprises. Go HERE for ticket links and further information on the entire Gods And Kings World Tour 2016.